REDD-Monitor: Could you provide a bit of background about CIFOR and the role that the organisation plays in the REDD discussion in Indonesia. Frances Seymour: CIFOR is an international organisation and we have our international headquarters here in Indonesia. If I’m not mistaken we are the only global scale international organisation with its headquarters in Indonesia. So it’s a unique position. As such, pretty much anything we do globally, we also do here in Indonesia, because we have a special relationship with our host country. And since REDD is one of our big research agendas globally, it’s also a big research agenda here in Indonesia. CIFOR’s agenda for REDD research, outreach and engagement started in late 2006, when the Stern Review and Ken Chomitz’s report came out. There were a number of things that built momentum towards REDD and we began developing our own research agenda. 2007 was the year of the preparations for the Bali UNFCCC COP which Indonesia hosted. CIFOR scientists participated in the IFCA [Indonesia Forest Climate Alliance] process that led up to that. We hosted the first Forest Day in Bali. So from the very beginning the development of CIFOR’s REDD research agenda was intertwined with Indonesia. Globally as well as in Indonesia, CIFOR was well positioned to have something to say about REDD, because we had done a ten year research project on the underlying causes of deforestation. One of the first things we did was to pull together a summary of that research and what we thought would be the implications for REDD. Given what we know about the causes of deforestation, then what would you do about it in order to reduce deforestation? We built on that platform from the Bali COP to develop a research programme here. As part of our research agenda, we developed a global comparative research programme on the first generation of REDD initiatives. It has four components. The first component looks at national REDD policies and strategies. It’s mostly a political economy analysis. To try to understand who’s at the table, how are they connected to each other and who gets a voice. To what degree do the policies and strategies match what we know about the underlying causes of deforestation? What are the roadblocks? Are there patterns across countries that we can learn from about what works better or worse? The second component of the project looks particularly at project-level initiatives. We have a population of 22 REDD projects around the world, of which six are in Indonesia, that we are following. They are not CIFOR projects. We are doing some quite rigorous before-after, control-treatment data collection, with a particular focus on impacts on livelihoods. So we will be able to say whether this REDD intervention has an impact on household income. But we are also looking at the impact on deforestation and degradation and the impact on governance and other issues. The third research component is on some of the technical, biophysical issues, looking especially to fill in some of the data gaps on emissions from land-use change and how to measure them. So we have teams of people out in the peatswamps collecting the leaf litter in bags and doing core samples in the soil to measure what is the carbon content, so that you have better equations for estimating what happens when you convert a peatswamp to something else. As well as some research on how to set a reference emission level, some modelling scenarios and what are the different implications and the different ways to do that. And then there’s a fourth component, dedicated specifically to knowledge sharing. We are trying to build a community of knowledge and getting the word out about what’s going on. The framing of it is trying to understand in REDD initiatives what is effective, what is efficient and what is equitable. The 3Es. We’re trying to assess the first generation of REDD activities with a hope of influencing the second generation. And of course as we go along, we keep learning and finding out what we left out in our first research design. So, for example, we are just now initiating a new strand of work on benefit-sharing that complements what we had already started. This includes a research focus on the so-called jurisdictional level, the sub-national scale above the project scale, which we had left out before. We’re constantly trying to learn and update our own approach. Everything I’ve mentioned has its incarnation in Indonesia. We are doing a Component 1 study on the politcal economy of national REDD policies and strategies in Indonesia. As I mentioned, six of the Component 2 project sites are here in Indonesia. Quite a bit of the Component 3 biophysical work, especially on the wetland forest land-use change is in Indonesia. A lot of the Component 4 outreach work, I’d say we have a particular concentration in Indonesia, that has enabled us to do more popular education than we have done in other places. For example, we have a joint website with the Ministry of Forestry, the REDD Indonesia website, to get all this information out in Bahasa Indonesia. REDD-Monitor: When will all the information from the global comparative research programme be published? Will it be a series of separate reports, or one big report? Frances Seymour: It’s coming out in multiple ways. Some pieces of it have already appeared in peer-reviewed journals. Other pieces have come out as CIFOR working papers. And we are in the process of producing the next edited volume. That will be a summary of findings of the first two years into the project and compiled between two covers. So it’s coming out in various forms, as quickly as we can. In the meantime, people are going to conferences, making powerpoint presentations with preliminary findings. We’re trying to optimise, calibrate, get as much out that we feel comfortable putting out, given the stage of data analysis. REDD-Monitor: How many people does CIFOR have specifically working on REDD in Indonesia? Frances Seymour: It depends on how you count, but according to the scientist who leads the work, it’s about 35, including PhD students, who are working directly with CIFOR. If you count all of our partners and consultants it gets up over 100. REDD-Monitor: And how many people in total in CIFOR? Frances Seymour: Our current on-staff head count is 193 and growing quickly. We will break 200 this year. That’s global, not just here in Indonesia. REDD-Monitor: What is CIFOR’s position on REDD? Frances Seymour: That’s easy, because CIFOR doesn’t take positions on anything. One of the reasons that we can play the role that we do is that we are able to be an independent source of information and analysis. We attempt to be relevant in the sense of answering “if, then” questions. If you’re trying to maximize this objective, then the analysis shows you ought to be approaching it in this way. But we are not taking the next step and saying and therefore it needs to be done in this way. We’re really putting options on the table. That’s our approach. Having said that, when we think about REDD, we think about REDD as an objective that has been acceded to by the international community. Nobody really disagrees with reducing emissions from deforestation and degradation. We feel that pretty much everything that CIFOR does is towards that objective, because we’re in the business of improving forest management with a special focus on livelihoods and good process. From the point of view of the objective, we’re in favour of it. Do we take a position on a particular programme, or incarnation of REDD by various proponents, global, national, local? No. That’s what we’re doing research on. Our question is, which of these different approaches meets the 3E test of effectiveness, efficiency, equity? REDD-Monitor: Last year, CIFOR organised a Forest Indonesia conference and CIFOR has organised a series of Forest Days, five so far and another one this year. Isn’t this quite an unusual thing for a research institution to do? What’s your justification or explanation for why CIFOR puts so much energy into these events? Frances Seymour: There’s a three-part answer to the question. The first is that we want our research to get out there. The knowledge sharing component is about making people aware of what we’ve done. Publishing in peer-reviewed journals only gets a tiny slice of the stakeholders, so we have invested quite a lot in a family of communications vehicles that reach different kinds of audiences in different ways. Our communications programme I would say is at the cutting edge of what research institutions do, getting us on facebook, twitter, blogging and videos. We have a pretty elaborate communications model. We have a strategy that is a web-based model that tries to take advantage of all the new ways of reaching people but it doesn’t abandon traditional outreach vehicles like publications and events. What we’ve found is that events, which is your specific question, can be synergistic with other ways of getting the word out so that when we’re publicising these events it brings people to our web-site and they click on to see the President’s speech and they stick around to download some publications, that kind of thing. So it’s a way to draw attention to our research. The flip side is that it’s also a way for us to learn, to bring people together to debate the issues and get ideas about what questions policy makers are asking that our research might be able to answer. So it’s a way for us, for example with the Forests Indonesia conference, to get a bunch of speakers, stakeholders in the room and get a sense of where the knowledge frontier is and where independent research might be able to craft a way forward. So it provides input into our research agenda as well as just a platform to get it out there. The third part of the answer is that precisely because we don’t take positions on an issue like REDD, we can be an honest broker and convene that kind of event, bringing in people from international organisations, governments, advocacy oriented NGOs and the business community. All of them feel comfortable enough to be on a stage that has our logo on it because they don’t feel like they’re going to be attacked, or something else. So it’s a role, I won’t say that we can uniquely play, but we’ve developed a reputation for being able to set those kind of stages in a way that maybe other players in the REDD debate in particular might have trouble doing. REDD-Monitor: The carbon trading question. I know that CIFOR doesn’t take positions, but what is CIFOR’s position on carbon trading? Frances Seymour: Well, as I said before, we don’t take positions, so we don’t have a position one way or the other on this. What I can say is that we have published analysis including in this book [“Moving ahead with REDD“], that was published several years ago, that suggests, depending on your assumptions about what the global regime is, you can have deeper emissions reductions for the same price if you allow carbon trading. Again, it’s one of those “if, then” answers. But of course reasonable people can disagree about the likelihood of getting a political regime that allows that economic instrument to function as it should. But we don’t take a position on that. REDD-Monitor: I’ll try to phrase this as an “if, then” question. Indonesia’s President has said that he wants to achieve 26% or 41% reductions in emissions, most of which will come from forest and land-use. If Indonesia goes down the carbon trading route, then Indonesia won’t be able to count that against its own emission reductions, because they’ll sell the carbon credits and whichever country buys those credits will count those emissions reductions. Which would put Indonesia in a very difficult situation, it seems to me. Frances Seymour: I’m not aware that the government of Indonesia has made that distinction in the context of the President’s commitment. I may be under-informed. REDD-Monitor: The danger is that there’s a double counting going on. Whoever buys the carbon credits will say that these are our reductions and Indonesia will say the same thing. Frances Seymour: Sure, but that’s just a specific case of the generalised problem that people have with offsets, right? Then it gets back to my first answer. Depending on the nature of the global regime and the caps that it includes, in theory it allows deeper overall cuts. But I am not aware of SBY [President Susilo Bambang Yudhoyono] having specified that it would be 26% or 41% above and beyond any emissions reductions that are sold on the carbon market. But that’s not a live question now, anyway, since we don’t have an international REDD offset market. But I’ve not heard anyone debate that so I’m not aware that the government has clarified that nuance to the commitment. REDD-Monitor: How does CIFOR think that REDD should be funded? Frances Seymour: Again, we don’t take a particular position. But in our research and things that we’ve published, we accept the idea that the needs of countries and communities for REDD finance will vary over time. The generalised three phase approach of readiness, getting ready for performance, policy change and then performance based payments makes sense as a progression. As well, the different needs even through that time-frame, some kinds of needs are more appropriately funded by the private sector and some more appropriately funded by the public sector. The private sector’s not going to fund things like capacity building so the public sector’s got to step in to do that. You’ve got that kind of trade-off. And you also have different capacities and risk profiles across geographies, both in terms of REDD projects in lower carbon, lower capacity governance countries in certain regions, as compared to regions with higher carbon, higher capacity of governance. You would look at a different funding profile for those two extreme situations. In any given case you’re going to have a mix of funding sources that are specific to that particular place, but also the time and the progression through the strategy. So it’s always going to be a mix, public, private, domestic, international, appropriate to the need. REDD-Monitor: What is CIFOR’s view of the US$1 billion deal between Indonesia and Norway? Frances Seymour: Again, CIFOR doesn’t take a position. But I think it’s fair to say that the deal has created an opportunity for CIFOR and everybody else to get more political attention to the work that we do in support of improved forest management in Indonesia. Both governments have approached CIFOR for advice and support. What can I say other than it’s a welcome discussion that has been precipitated by the Letter of Intent. If I may, I’ll give a personal answer to that question. I started working in Indonesia in 1986-87, so we’re talking about a 25 year horizon. I’m willing to say that the Letter of Intent was the single most significant game changer in that 25 years of observing the Indonesian forestry sector. My own personal perspective, looking over that horizon, I would say that the Letter of Intent prompted a tectonic shift in the dialogue about forests, who participates in it, realignment of domestic constituencies among themselves and vis-à-vis international constituencies in a way that I haven’t seen in 25 years. It creates an opportunity for a variety of issues to be on the table at the highest levels, I mean head of state level, to talk about what is the future of Indonesia’s forests. What we experienced at the Forests Indonesia conference last September, which was an open discussion among all the different stakeholders about fundamental questions about which way forward, might not have been possible in the absence of the Letter of Intent. So that’s a very good thing. REDD-Monitor: CIFOR put out a report last year that was quite critical of the moratorium. The report wasn’t only critical, however, it also put forward a series of recommendations for improving the situation. Do you think that these recommendations are likely to be implemented? Do you think that things are moving in the right direction? Frances Seymour: I think we were clear in the working paper on the moratorium that it needed to be evaluated not as an instrument for immediate carbon reductions but rather an instrument for shifting to a better governance framework for reducing emissions from deforestation and forest degradation. The working paper talked about lost opportunities in terms of the relatively narrow scope of the area covered by the moratorium – such as the omission of secondary forests – and the many exclusions that, depending on how they are operationalised, could further reduce its scope. Unfortunately the omission of secondary forests makes it harder to “swap” planned conversion between lower and higher carbon density forest land, especially in the interest of conserving peatland forests. But at the same time, we pointed out that it provided some traction in terms of openness, transparency and public participation, good governance principles in terms of having as a commitment, having the consolidated moratorium map with a revision process every six months. Again, this is the first time in the 25 years that I’ve been watching, everybody will have the opportunity to comment; having this posted on the web is revolutionary. To have access to the data and be able to sit around a table together and discuss what’s going on is new. 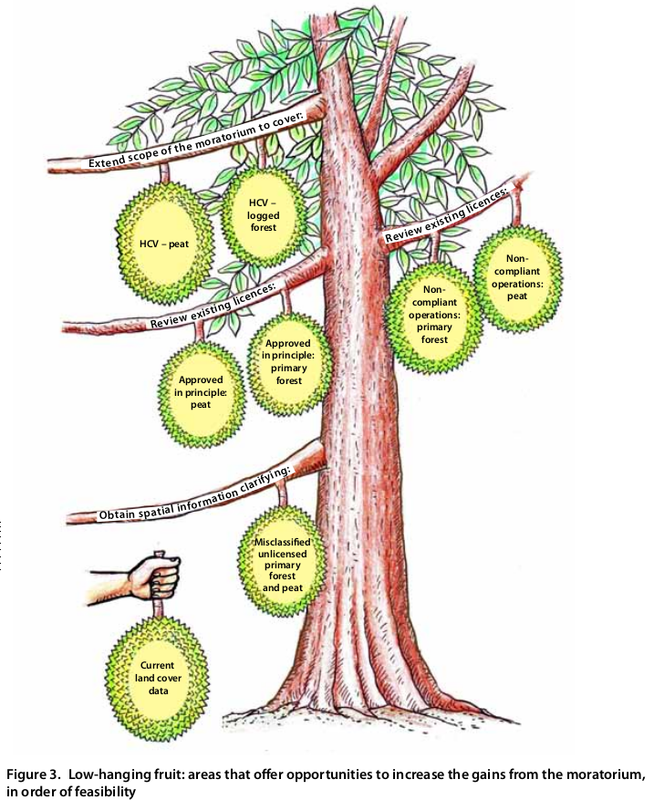 That then provides a platform to start plucking some of that low-hanging fruit and higher-hanging fruit that was depicted in the cartoon in the report. The good news is that that process of opening up the decision making is happening. That is a good thing. We all need to be realistic about how quickly the harder parts of it can go forward, because of the constraints that are political in nature. Some of these are really tough because there are entrenched vested interests that will take some serious political will to deal with. As we know, there’s a lot else going on here, fuel price subsidies and everything else in the broader political context. There are also data constraints and capacity constraints and all those things that we have to be realistic about how long things take. I think that there is good will in important places, the President is serious about his commitment. We need to be realistic about how long these things take, but at least it is forward progress in having that platform of common data to work together to achieve change. REDD-Monitor: There was a Reuters report last year about the Rimba Raya project in Kalimantan, that described the project as a “casuality of labyrinthine Indonesian bureaucracy”. In the end the Ministry of Forestry cut the project in half and handed over half of it to an oil palm concession. Do you think that that’s typical of the problems that REDD developers are facing in Indonesia, or do you think that that’s a one-off situation? Frances Seymour: I can’t comment on the particular issue because CIFOR hasn’t done research on that particular aspect of the project – that is the controversy surrounding the licensing process and legal status of the land – so it’s just what I read in the newspaper. Before I could render a judgment on what is typical, we would want to look at the whole population of REDD projects and right now we’re looking at six that are facing various kinds of challenges, and the results of that research are not in yet. The only comment I would make is that Indonesia’s land status, allocation to different uses and process for changing that status is unclear and contested. Part of that is a legacy of having done the TGHK [Peta Tata Guna Hutan Kesepakatan – Map of Agreement of Forest Land Use] process almost 30 years ago, which was done at very broad scales with 1:500,000 scale indicative maps. In the meantime we’ve had pretty radical decentralisation with functions down to the Kabupaten [District] level and then partial re-centralisation. We’ve had permits being issued by different agencies at different levels. So it’s confused, it’s confusing. Nobody should be surprised that when a whole new instrument like REDD comes into that context, and where the REDD regulatory framework is still being developed, there are going to be problems. REDD-Monitor: Indonesia recently signed an illegal logging agreement with the EU. What do you think are the lessons learned from the illegal logging debate in Indonesia for the debate on REDD that’s currently taking place? Frances Seymour: Well, it just so happens that we have an entire working paper commissioned by UNODC [UN Office on Drugs and Crime] on exactly that question, specifically for Indonesia. It came out late last year. At the end of the report, there is an articulation of lessons learned from the FLEGT [Forest Law Enforcement, Governance and Trade] process in Indonesia. It is basically that the good governance principles that have been necessary for a successful SVLK [Sistem Verifikasi Legalitas Kayu – Timber Legality Verification System] process will also be necessary for REDD. Things like, the strength of the agreement depends of the strength of the multi-stakeholder process that produced it. These things take time, so we’ve got to invest in an inclusive process to come up with the rules of the game. Another lesson is that the credibility of the whole enterprise is going to depend on transparency of data so that we all know what we’re talking about à propos our moratorium discussion just now. As well as the independence of those who validate data and performance, the institutional relationships of who does the MRV [measuring, reporting and verification] type roles in REDD. There is a key challenge of capacity. If you don’t have the capacity to deliver, it doesn’t matter how good your policy framework is, and making sure that the gap between those two things doesn’t get too far out of whack. It’s the basic good environmental governance processes that were in Principle 10 of the Rio Declaration. This is not new: Public access to information, participation in decision making, accountability issues, capacity building, it’s those lessons. REDD-Monitor: When the idea of REDD came up five or six years ago, it was often described as a simple thing of putting a price on the carbon stored in forests and then there was going to be a complete change and deforestation was going to stop. Clearly, five years down the line that’s not happening and I’m not sure anyone thinks it’s going to work like that any more. On illegal logging this agreement was the result of at least a ten year process. And it’s only, at this stage, an agreement. Frances Seymour: Well, let me make a couple of comments. First of all, only those who had no previous experience in the forestry sector believed that REDD was going to be quick and easy and a silver bullet. The fact that discussions started in the climate policy arena where there might be people with backgrounds in energy, who thought that maybe this was going to be more like CDM finance for rural energy projects, might have led some to believe that we just need to create the market mechanism and we’re done. I don’t think anybody who’s working in forestry thought it was going to be easy. So this is not surprising to those who have been working on this agenda for a long time. But the fact that finance for REDD came with political will for climate change and on a pay-for-performance basis led one to believe that actually it could be different this time. The REDD finance for change in the forestry sector might in fact be transformational in a way that might be different from other generations of the TFAP [Tropical Forestry Action Plan] or the ICDPs [Integrated Conservation and Development Projects] or other initiatives that have come along. I would never say that REDD is easy. Compared to the illegal logging agenda, you’re right that ten years is the right time frame, because it was September 11th, 2001, when there was another historic event, there was the first FLEG [Forest Law Enforcement and Governance] Ministerial, also hosted in Bali. So all these things were born in Bali. It was at that event, that for the first time, forestry minister-types, not only from Indonesia but from around the world, made public speeches about illegal logging. It’s hard for people who weren’t around then to realise, but you couldn’t talk about it then. It was a taboo subject; to even have senior government officials admitting that there was corruption involved or that this phenomenon was happening was a brand new thing. To get over that taboo and the fact that with illegal logging it was starting almost from a base of zero open discussion and analysis makes it harder than REDD, where you start out from the get go with pretty much consensus that the objective is a good thing and it’s a positive step forward. We might be able to move a little faster with REDD than was the case in the illegal logging agenda. REDD-Monitor: What is CIFOR’s position on safeguards and REDD? Indonesia has signed the UN Declaration on the Rights of Indigenous Peoples and at the same time, the Forest Law states that “Customary forest is state forest.” Does CIFOR believe that principles such as free, prior and informed consent can be implemented given this context? Frances Seymour: CIFOR is not going to take a position on how exactly safeguards should be incarnated in the UNFCCC agreement. But our research is very much premised on hypotheses about the importance of protecting livelihoods, rights and for REDD to meet the effectiveness, efficiency, equity test. So it’s embedded in our research agenda. Our preliminary findings from these pilot project data collection exercises in Indonesia and elsewhere indicate that there is reason to be concerned. For example, data collected in 2010 shows that in some project sites, villagers interviewed had not yet heard about REDD or had not yet been consulted about the REDD intervention in their communities. Very interestingly, sometimes that was an intentional decision on the part of REDD proponents because the whole REDD thing is so uncertain in terms of whether or not there’s going to be an agreement or whether or not there’s going to be finance. They didn’t want to raise “cargo cult” type expectations. There is an ethical dilemma that project proponents are facing between FPIC and raising unrealistic expectations. There is also a specific concern about the tenure insecurity of these communities. Interviews with villagers of their perceptions and a review of the status of the land that’s being covered by the project reveal a degree of insecurity. The concern is that if there’s a new revenue stream somebody else is going to come in to claim it. There’s clearly a need for safeguards to protect from those outcomes. Our research is also definitely relevant to the safeguards agenda. There’s a sense that in Indonesia and elsewhere there’s a need for more pro-active attention to make sure that vulnerable peoples’ rights are not violated or their livelihoods made worse off. REDD-Monitor: Lou Verchot was critical about the outcome on safeguards in Durban and not particularly happy about what came out on financing REDD. Could you please comment on the outcome of the UNFCCC negotiations in Cancun and Durban? Lou Verchot: The recent decisions in the UNFCCC have been rather weak about how the safeguards are to be implemented. In some ways it is understandable. Governments are making decisions about the standards to which they will hold themselves accountable. The decisions in Cancun and Durban only require that countries to provide information on how the safeguards are being addressed and respected. Countries do not have to collect and report information on performance or outcomes and they do not have to report on trends over time. This is why I commented that the decision was weak. There are no performance goals or objectives, no standards of performance and no reporting on performance trends over time. If we are serious about the safeguards, it is the outcomes that matter, not the effort. In the current policy formulation, failed efforts will be counted as well as successful ones. As Frances outlined above, the safeguards are necessary to protect against the loss of resource access by poor and vulnerable communities. The lack of teeth in the decision means that other mechanisms are going to have to be put in place to ensure this protection. This means a greater role for civil society organizations in some cases. However, in many developing countries, civil society organizations are notably weak and will not be able to play this role adequately. So it is disappointing that while many recognize the nature of the problem, we have done little through these decisions to really solve it. REDD-Monitor: There’s been a lot of discussion on REDD in Indonesia, and there are something like 40 REDD projects in the country. At the same time, there remains a very high rate of deforestation, there is still expansion of oil palm concessions, pulpwood concessions, mining concessions, oil exploration concessions. Are you optimistic or pessimistic about REDD in Indonesia? Frances Seymour: There are two opposing sets of forces. One set is what you just described, where we have many interests in expanding the area planted to oil palm, to fast-growing timber species, to other agricultural crops, developing infrastructure corridors, exploiting mineral resources and all of those are leading to continued deforestation, possibly accelerating in some places, but at least continued pressure. We can characterise that as business as usual with the understanding that depending on commodity prices, business as usual could get worse for the forest or better for the forest. You also have a set of constituencies driving things in the other direction. Those include the ones narrowly associated with REDD that are promoting this REDD scheme narrowly defined, payment for performance in avoiding deforestation and forest degradation. But there is also the broader climate change debate that includes a lower emissions development strategy that people are starting to talk about. And there is the wildly under-appreciated issue – but we hope to do our part to increase the appreciation – of the importance of forest in adaptation to climate change. I think once people responsible for economic development in Indonesia understand that the viability of sustainable agricultural production and food security, water security, the need to invest in infrastructure, that forests are part of a solution to all of those problems, then the incentives will start to change. You also have whole constituencies with other interests, such as those aligned around tenure reform, which has its own momentum. People have been talking about this for 20-odd years, but there’s an alignment of interests that includes those who are worried about REDD as a threat to tenure security, and those who understand that instrumentally we’ve got to clarify these tenure questions for REDD to work, because in a payments for performance system you’ve got to know who to pay and how to ensure that the benefits go to the right people. There’s been a lot of investment over the years from civil society groups on how to solve this problem, now there seem to be serious high-level discussions about how you reform forest tenure in Indonesia. For all of those reasons there is progress on this countervailing agenda that would serve to reverse some of the trends that you started the question with. I think the question whether you’re optimistic or pessimistic depends on your sense of time-scale. At what point are the forces that might drive change toward a more climate-friendly, longer term sustainable development model, compared to business as usual? There are so many variables that have to do with externalities like commodity prices, but also internal variables like a President who has publicly said that he’s committed to these emissions reduction targets, that he’s dedicating the next three years of his Presidency to this agenda. We’ll see what happens. But I think that there are reasons that supporting this whole process with the best information and analysis, which is our business and as well as some convening and capacity building, is a “no regrets” approach. We can be optimistic that our inputs are leading to progress and we’ll see what happens. A lot of your questions have to do with what are reasonable expectations for the pace at which change can take place. My first five years in Indonesia took place before CIFOR even existed. When you’re climbing a mountain, you don’t know how far you’ve climbed until you look back down. When I get together with colleagues that I worked with 20-25 years ago on the first generation of social forestry projects, we’re amazed at the progress. 25 years ago the State Forest Corporation [Perum Perhutani] would not think about sharing timber revenues with local communities in Java. Now they do. 25 years ago there wouldn’t be an open discussion about recognising indigenous peoples’ claims to forest lands. Now that discussion is wide-open. 25 years ago there would never have been a public discussion about how to deal with illegal logging and corruption within the forestry sector. Now that’s common. So, from a 25 year perspective, look at all the progress. Look at what’s happened. I think it’s important to keep that time-scale in mind and keep that as a source of optimism that change can happen and to temper perhaps unrealistic expectations that now that we have a Letter of Intent, within six months all these problems are going to be solved. This interview is the seventh in a series of interviews with key REDD actors in Indonesia. REDD-Monitor gratefully acknowledges funding from ICCO for this project. PHOTO Credit: Photo of Frances Seymour by Dita Alangkara for CIFOR. CIFOR still seems attached at the slippery hip of market based solutions (sic).